With improved outcomes following cardiac surgery, health related quality of life (HRQoL) gains increasing importance for the better judgement of choosing the preferred treatment strategy in the individual patient. The physician perception of patient preferences can differ considerably from actual patient preferences, underlining the importance of gathering evidence of actual patient preferences before and quality of life after cardiac surgery. 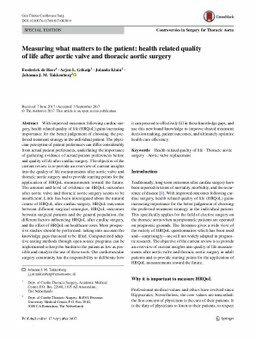 The objective of the current review is to provide an overview of current insights into the quality of life measurements after aortic valve and thoracic aortic surgery and to provide starting points for the application of HRQoL measurements toward the future. The amount and level of evidence on HRQoL outcomes after aortic valve and thoracic aortic surgery seems to be insufficient. Little has been investigated about the natural course of HRQoL after cardiac surgery, HRQoL outcomes between different surgical strategies, HRQoL outcomes between surgical patients and the general population, the different factors influencing HRQoL after cardiac surgery, and the effect of HRQoL on healthcare costs. More prospective studies should be performed, taking into account the knowledge gaps that need to be filled. Computerized adaptive testing methods through open source programs can be implemented to keep the burden to the patient as low as possible and catalyze the use of these tools. Our cardiovascular surgery community has the responsibility to deliberate how it can proceed to effectively fill in these knowledge gaps, and use this newfound knowledge to improve shared treatment decision making, patient outcomes, and ultimately optimize health care efficiency.